With recent announcements to lower the small business tax rate in 2018 and 2019, the incentive for high-income individuals to use corporations for tax planning has increased. 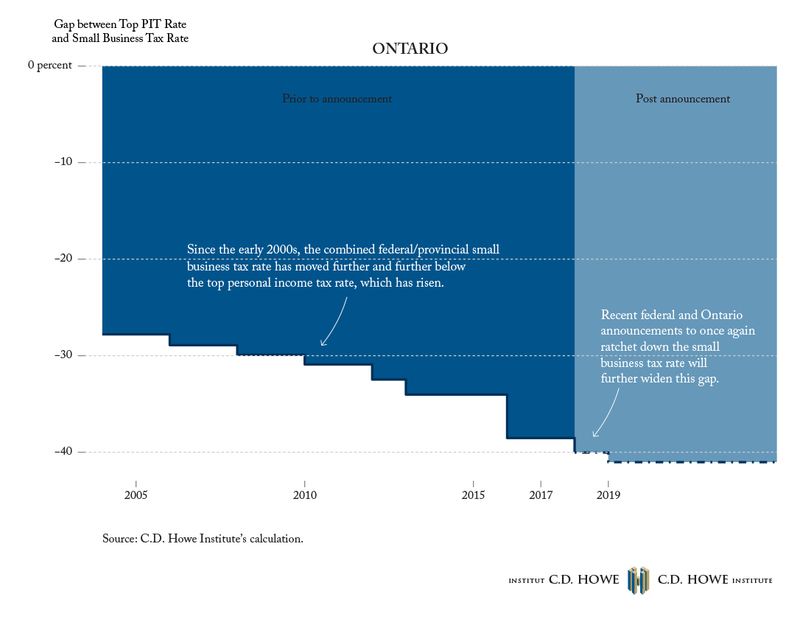 In this edition of Graphic Intelligence, we highlight the recent reductions to the small business tax rate in Ontario and at the federal level. Lower small business tax rates (combined with recent top personal rate increases) have raised the gap between the top personal income tax rate and the small businesses tax rate. The recent cuts to the small business tax rate in 2018 and 2019 will further widen this gap, increasing the tax incentives to incorporate – which is at odds with the thrust of the July 2017 proposed federal small business tax reform. Farah Omran is a Researcher at the C.D. Howe Institute.